You should never use your nails as a tool — for example, to open pop cans, pry off jar lids, or scratch off stickers. Trimming regularly and keeping the nails short reduces the risk of trauma or injury. Thick toenails that are difficult to cut can be soaked in warm salt water for 5-10 minutes to minimize the chance of cracking and splitting. Most importantly, “bathroom surgery” must be avoided at all costs! Many people try to “dig out” ingrown toenails or file away fungus nails. It’s important to see a dermatologist or a podiatrist for these issues, rather than risk greater injury. 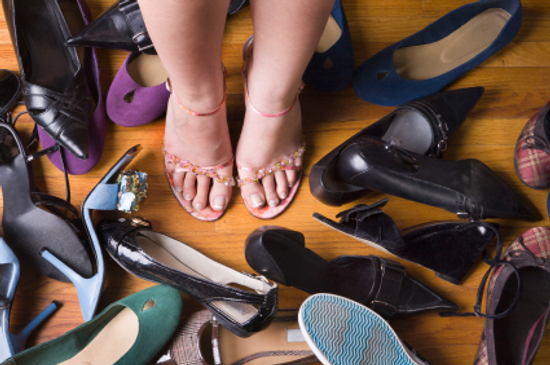 Dermatologists recommend wearing shoes that fit properly and do not squish the nail. Alternating shoes each day can also cut down on systemic damage done to the nails over time. Our podiatrist friends over at The Center for Podiatric Care and Sports Medicine in New York City recommend choosing shoes that leave half an inch of space from the big toe to the top of the shoe with a wide toe box. “Look for shoes that allow your big toe — all of your toes, really — to lie flat and wiggle around a bit,” they write. Lastly, the American Academy of Dermatology suggests wearing flip-flops at the pool and in public showers to reduce the risk of infections caused by fungus. Even with this precaution, we find that bacteria, fungus, and pathogens have a way of seeking people out — especially if they’ve suffered an infection in the past or have a genetic predisposition to fungal infections. That’s why the SteriShoe UV shoe sanitizer is such a worthwhile tool in your fight against yellow fungal nails. Any microbes you managed to pick up in your travels will be eliminated in one 45-minute cycle, leaving you with sanitary, fresh-smelling shoes.